The number of cases of a potentially lethal hospital infection has rocketed since the 1990s, figures show. The Department of Health has revealed there were 44,488 cases of C. difficile in over 65s in England last year. It was the first time mandatory surveillance of the diarrhoea-causing infection has been undertaken. In the early 1990s there were about 1,000 cases a year, but by 2003 the total rose to 35,536, England, Wales and Northern Ireland data showed. However, this was only collected on a voluntary basis so the true figure may have been higher. These latest statistics have showed that C.difficile is nearly seven times more common than MRSA, although the superbug is more deadly. Office for National Statistics data has shown C.difficile was the underlying cause of 934 deaths in 2003, almost three times as many as MRSA. Chief nursing officer Christine Beasley said some of the rise in infections was down to better reporting. But she added it was largely due to the fact that advances in medical care were keeping people alive for longer, which meant they were more susceptible to bugs. "The immune system does not work as well and, therefore, people are more vulnerable," she said. She said the C. difficile, which stands for Clostridium difficile, will now be included in the government programme to fight MRSA. The government introduced mandatory surveillance after a new and more virulent strain of the infection, which was first identified in 1978, emerged. And earlier this year Royal Devon and Exeter Hospital, Exeter, confirmed C. difficile had been a contributory factor in the deaths of 13 patients since January this year. 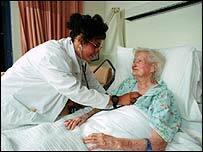 C. difficile usually affects the elderly, although young people have been affected, and can prove fatal if antibiotic treatment fails to kill all the spores in the gut. It is also very difficult to eradicate from the ward environment, which means it is easy for other patients to become infected. 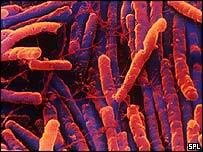 The spores of C. difficile cannot be destroyed by hand gels, as MRSA can. Experts have said staff must use soap and water to get rid of the bug, and hospital wards must be cleaned using more powerful disinfectants than usual to eradicate the bug. Professor Mark Willcox is a consultant medical microbiologist at Leeds Teaching Hospital who worked on a C. difficile standards group that reported to the Department of Health. He told the BBC: "The most worrying concern is not so much how many cases we are having, but this new strain which appeared first in Canada about two or three years ago. "It appears to cause an excess number of cases when it occurs in a hospital, but the particularly worrisome thing is that it causes more severe cases - patients can be very ill with this strain." And Simon Williams, director of policy at the Patients Association, said while he welcomed the measure being taken, he still had concerns. "I am not confident we have fully got to grips with this yet. As with MRSA, patients do not expect to go into hospital and get ill."
The Department of Health also released figures for the number of cases of GRE, a bug which can cause wound infections and occasionally blood poisoning. Although hard to treat it is not particularly virulent compared to other hospital infections - there were just 620 cases.